Tonight on BBC One, Gary Lineker presents a look back at the Premier League season, which saw the Foxes become unlikely league champions. It's on at 22:45 BST unless you're in Wales (23:10) or Scotland (23:45). And with that I bid you goodnight. And so comes to an end the most memorable Premier League season ever - a campaign in which 5,000-1 outsiders Leicester City won their first ever title. A campaign in which Jurgen Klopp took over Liverpool, but they finished below West Ham and Southampton in the league. A campaign in which Chelsea sacked the most heralded coach in their history and only just finished in the top half. A campaign in which Rafael Benitez started off as Real Madrid boss and ended it getting Newcastle relegated to the Championship. Manchester United have taken 22 points from a possible 24 in their last eight Premier League games at Old Trafford. Only bottom side Aston Villa (76) have conceded more top-flight goals this season than Bournemouth (67, level with Norwich). Manchester United boss Louis van Gaal to BBC Sport: "I like the second half, it's only the last minute I don't like. "We didn’t reach our aim. We have to qualify for the Champions League. We have still the FA Cup final to go. Everyone has to make up his mind at how we have done this season at that time. "I can only say I have a contract of three years and I want to fulfill that. The transition period is not over yet. I am still the manager." Bournemouth captain Tommy Elphick told Sky Sports: "To concede as we did just before half-time is hard to take. "We were too passive in our defending and we didn't retain the ball when we got it. We usually play with high pressing. We tried something different and it didn't work. The magnitude of what we've done can't be overlooked - when you see the teams who went down." Bournemouth manager Eddie Howe has confirmed his club have rejected a bid from West Ham for Callum Wilson and Matt Ritchie. He denied it was for the reported £25m. "We had a bid yesterday evening. Why it come in the day before our season has finished, I don't know. Howe also said Bournemouth had been unable to train properly for tonight's game because their training pitches had been dug up. Bournemouth boss Eddie Howe told BBC Sport: "It's been a difficult couple of days. Not ideal for anyone. It was disappointing overall for us. They dominated possession, we struggled to get a stranglehold on the game. "United were a level above us in most departments. We didn't make it as difficult for them as we could have done. There's lots for us to ponder over the summer. "It's been a fantastic season. We're still in the Premier League - that was the objective. "Louis van Gaal might have thanked Manchester United's supporters for their backing at the end of the game but the reception he received was anything but unequivocal. "There were certainly a few boos, although a combination of cheers - and the public address system - helped to drown them out. "Van Gaal will be walking out in front of his team at Wembley for the FA Cup final on Saturday, but has he just taken charge of his last game as United boss at Old Trafford?" Anthony Martial has assisted each of Wayne Rooney’s last three goals in all competitions. The French youngster has had a hand in 15 Premier League goals this season (11 goals, 4 assists), more than any other Manchester United player. Stuart O'Hara‏: The first and last goals of this Premier League season were both own goals at Old Trafford. Ryan: First goal of the season? Own goal for Manchester United. Last goal of the season? Own goal against Manchester United. Feels like a lifetime ago but Manchester United beat Tottenham 1-0 on the opening day with Kyle Walker scoring an own goal. Louis van Gaal walks around the pitch applauding the Manchester United fans, and they seem to be returning the compliment. They've only finished off the top four on goal difference, and they've got an FA Cup final yet to come. "Manchester United end with three goals, which doesn't quite get them to the half century. "Their 49 goals is their lowest league return since 1989-90, when they only managed 46. "And Bournemouth's injury-time consolation means David de Gea is denied a share of the Golden Glove, which Arsenal's Petr Cech wins with 16 clean sheets." "On behalf of my players, staff and myself, thank you for your unconditional support. "Wherever we have played, however things have gone on the field, you never let us down. "We hope to bring the FA Cup home to you." They're Louis van Gaal's words to Manchester United fans. His parting words? We'll see this summer. Bournemouth fans sing "You're getting sacked in the morning" as Louis van Gaal speaks. It looks like Louis van Gaal will be speaking to the fans as we predicted earlier. "When Marcus Rashford was playing his first league game of the season at West Brom's training ground on 8 August, he could not have dreamed his last would be at Old Trafford in the Premier League. "Rashford's transformation from an Under-18 player to potential England international is one of the stories of the season. 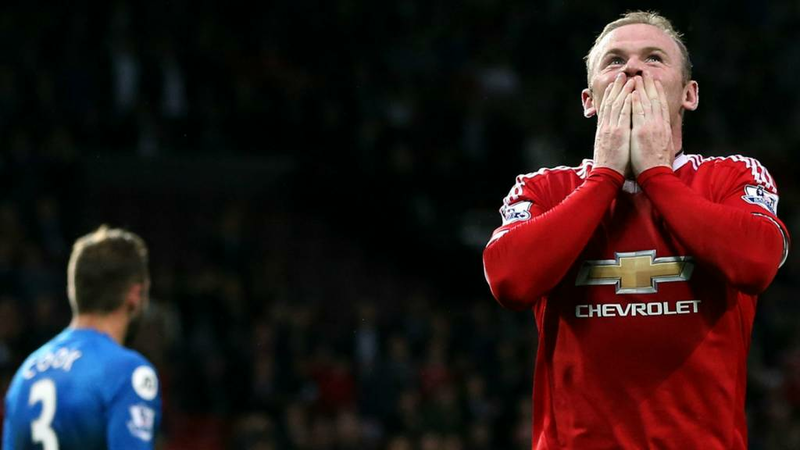 "The Mancunian now has eight goals in 17 appearances and left to a standing ovation."